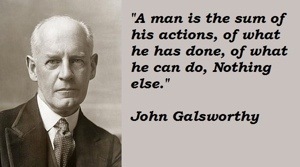 Nobel Prize winning author, John Galsworthy (1867-1933). To people of a certain age and living in the UK, he is best known for the Forsyte Saga, shown on television during the 1960s to critical acclaim. Despite coming from a very privileged background John Galsworthy challenged the ideals of Victorian Society as well as being a campaigner for prison reform, women’s rights and animal welfare. What brought me to research this very interesting man was a watercolour by Mrs Paula Thrift of Bury Church, famous for its 12th century, cedar-shingled spire. 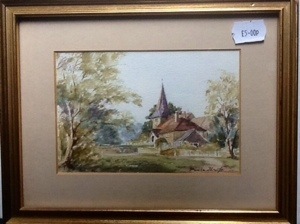 I have not been able to find out anything about Mrs Thrift but I think she was a water-colourist of some talent. I am sure that John Galsworthy would have known this view. To finish here is a photo of the man himself with a quote.